The impact of the implementation of Rural Free Delivery service for the rural areas of the United States at the turn of the twentieth century is comparable to the dynamic change in American culture wrought by the introduction of the World Wide Web one hundred years later. The US Postal service was established even before the United States became a nation. In an acknowledgement of the importance of implementing a communication system that would link a widely dispersed population, the Second Continental Congress ordered in 1775 that a mail system be constructed connecting the colonies. Benjamin Franklin was named the system's first Postmaster General. By the end of the nineteenth century, however, fully 90% of the country's citizens did not have direct access to this system. These were the people who lived in the nation's rural areas. In a time before the telephone, the radio or television, the mail was the only link that connected the rural population to the outside world. However, it often required up to a day's journey to the nearest post office to establish this link. It is no wonder then, that the farmer's connection to the rest of America was sporadic and tenuous. This all began to be changed in 1896. In that year the Post Office Department established rural mail delivery (RFD). It was a massive and costly undertaking that took years to fully implement nation-wide. Once established, however, it abolished forever the isolation of America's rural residents. Now, the outside world was no farther away than the mailbox on the passing road. The next dramatic change followed in 1913 with the introduction of parcel post to rural areas. As a result, not only information was delivered to the farmer's doorstep, but also merchandise ordered through the pages of the Sears and Montgomery Ward catalogues. "...here is something that comes right to our very doors, and we can't help seeing and feeling the good of our money." In 1903, a reporter rode with a rural mail carrier in Michigan and provides insight into this new phenomenon. "We made the trip in a small, light, covered wagon, built expressly for this purpose, so as to secure the comfort and convenience of the carrier with the least possible weight. . . . In the bottom of the front end of the wagon and in easy reach of the driver's seat is a set of pigeon holes in which he arranges his mail as he drives, so as to have it convenient for delivery. This man must have had between fifty and seventy-five pounds of mail when he started out that morning. Delivery begins about two miles out from the post office. The exterior of the cart is painted a light blue, and from its size and color the vehicle is conspicuous a long way off on the country roads. The carrier wears the gray uniform .of the regular postal service. Each carrier is required to furnish his own wagon and the horses to draw it, and to provide for the keep of the horses. Two horses are necessary, so that they may have alternate days in which to rest. It takes a pretty good horse to draw such a wagon over twenty-five to thirty miles of country roads in all kinds of weather, at all seasons of the year, making a hundred or more stops, and yet the horse must be docile enough so that he will halt at a word from the driver, when the wagon is alongside a box, and stand there until he gets the word to go on, since both the driver's hands must be occupied in opening the box and depositing the mail in it. For all this and his own services the carrier receives $600 a year. The Department requires each man living on a route, who wishes the service, to furnish an iron box and set it up on a post of suitable height at some point on the route convenient to the carrier. Those who do not do this must go to town for their mail. Where a man lives off the route as laid out by the Department's agent his box is set up at the nearest convenient point and he comes to it for his mail. With few exceptions the boxes are so near the houses that a signal affixed to the end of each can be seen from the house. When the owner of a box leaves mail in it for the carrier to collect he raises the signal, to attract the carrier's attention; when the carrier has put mail in the box, he leaves the signal raised. . . . The fact that the Department insisted on certain requirements as to boxes was one of the things which made trouble in the establishing of the route. These requirements in the main are that the boxes must be of iron, and one of some dozen or so kinds approved of by the Department as suitable. These boxes are not made by the Department, but by private firms. The farmer is obliged to buy the box and set it up, at a cost of about $2 to $3. Many farmers insisted that they should be allowed to set up a homemade wooden box. Some claimed that they could not afford to pay for the required iron box. I suspect that the real reason in most cases was because they objected to being - as they thought - "dictated to." A few men held out for a time after the route was established and did not provide boxes, but eventually they all got into line. . . . The rural carrier is a daily connecting link between the farmer and the world. By his help the farmers are sure of their mail every day. Without it people who live three miles or more from a post office rarely get their mail oftener than once a week, unless some one goes to town on an errand and brings back the mail for a whole neighborhood. In this case the mail is apt to be left at some central point for chance distribution, which may cause delay or loss. . . . Along the whole route I improved every opportunity to talk with men and women about rural delivery. I did not find any who did not approve of it, and most were enthusiastic. One man said: 'It's one of the things that seems to bring back to us farmers some of the money we've been paying out for years for taxes' - indirect taxes in the way of duties, I infer he meant. 'Congress votes money, lots of it,' he went on, 'for armies, and war ships, and river and harbor improvements, and public buildings in cities and towns, and a good many of us live and die and never see none of 'em. But here is something that comes right to our very doors, and we can't help seeing and feeling the good of our money.' "
This eyewitness account appears in: Thrasher, Max Bennet, Thirty Miles with a Rural Carrier, in Independent, (1903), republished in: Hart Albert Bushnell American History Told by Contemporaries v. 5 (1929); Bruns, James H., Reaching Rural America: the evolution of rural free delivery (1998). 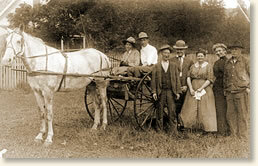 "Riding a Rural Free Delivery Route, 1903" EyeWitness to History, www.eyewitnesstohistory.com (2009).